After only five years in its new multi-purpose facility and with the recent sale of our former shop facility, Foster Coach found itself bursting at the seams. 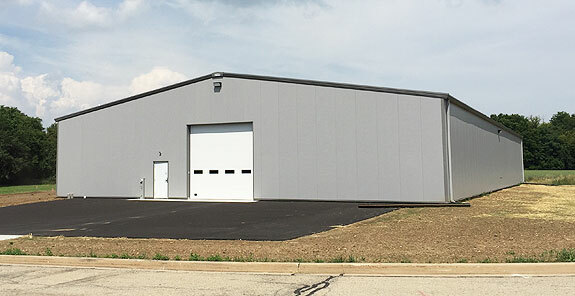 We are pleased to announce that we have recently completed construction of a heated 11,900 square foot storage facility located across the street from our main facility. 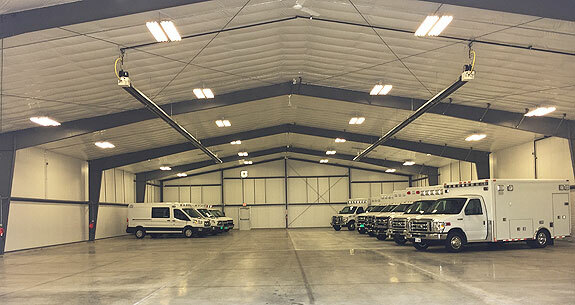 This new building will provide the space needed to house our extensive inventory of new, used, and remounted ambulances, while also providing a safe and secure storage location for customer-owned units arriving for service and/or awaiting pickup once the service work has been completed. As it has for the past 60-years, Foster Coach remains committed to selling and servicing ambulances long into the future! At the annual Horton dealer meeting, Foster Coach Sales was awarded the Dealer of the Year award for second place in national sales. In just three years Foster Coach has risen to second place in sales for the organization. We would like to thank all of our customers who have helped make this happen! Their support and sales are greatly appreciated! FOSTER COACH IS PROUD TO ANNOUNCE THAT AFTER ONE YEAR OF SALES FOR MEDIX AMBULANCE, SALES CONTINUE TO GROW! EMS Administrators are required to face an ever-changing economy and meet budget without compromising safety or dependability. With focus on quality, safety and durability, Medix utilizes 3D “Solid Works” CAD software for interior and exterior component designs independently tested to exceed all FMVSS and AMD industry standards by third party ACLASS/ISO certified testing facilities. The Medix MSV II uses many innovative products in its design. This includes state of the art three quarter inch CNC cut “High Density Polyethylene” (HDPE). that have high impact strength, resistant to abrasion and staining, easily cleaned, and resistant to fluid borne pathogens. Full length anodized, extruded handles are used on all Lexan sliding windows which are back mounted on HDPE window frames. The body door design feature CNC cut, formed and welded single piece doors mounted on CNC cut, milled and welded door frames certified to FMVSS 206 30G. This process provides consistently repeatable components that are interchangeable unit to unit. These CNC parts can be shipped within 24 hours allowing you to minimize your down time and keep your ambulance in service. You can learn more about Medix Specialty Vehicles, Inc. on their web site located at www.medixambulance.com or by contacting Foster Coach Sales, Inc. at (800) 369-4215 or on our website www.fostercoach.com . Innovation, State of the Art Materials, 3rd Party Testing Compliance and an Owner’s Personal Concern for the Quality, Safety and Dependability of every Medix Ambulance we build is what sets us apart. Experience the Foster Coach and Medix Difference! The new Foster Coach building at 903 Prosperity Drive in Sterling, Illinois. Steve Foster, President of Foster Coach Sales, Inc. of Sterling, Illinois, is proud to announce the completion of two new facilities for Rock River Auto Body, Inc. and Foster Coach Sales, Inc. Both new buildings and business operations are situated on about 2.5 acres, approximately one half mile west of the old Foster Coach facility in Sterling’s Meadowlands Business Park. 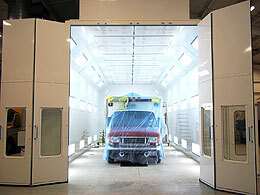 Owned by Steve Foster, Rock River Auto Body, Inc. opened its new facility in mid-December 2010. 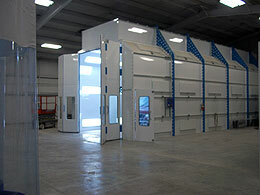 The 8,000 square foot body shop features a 45 foot long down draft paint/spray/bake booth. 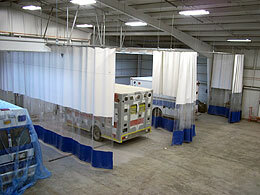 The air make up unit can take the room temperature from 70 to 140 degrees in one minute and a half. In addition, the shop has in floor heat and air conditioning for climate control. Foster Coach Sales, Inc. had outgrown its old facilities as well. Despite a down economy, Foster Coach Sales, Inc. has experienced continued growth each year. Therefore, we decided to build a new facility in conjunction with the body shop which is located across a shared parking lot. Total work and storage area will be 16,000 square feet, while offices comprise another 2,600 square feet. While the timing seemed bad to expand, it made sense for us to move out of retrofit facilities that we had simply outgrown. We were in our old building since 1982. It was originally a grocery store and was never meant to be a specialty vehicle service facility. After we celebrated our 59 years of continuous service, we look back on all the wonderful customers over the past and would like to take this opportunity to say “Thank You” for your continued support of us and our products. We have led the nation in sales and service once again and have for the last 15 years straight. We could not have done it without you the customer and our fine support team here in Sterling. We look forward to the next decade with pride and optimism. We could not be where we are today if it was not for all the fine support staff in Sterling, as we are told daily in the field how important of a part they play in our success. As we continue to meet the challenges of today’s market we look forward to the future and proudly reflect on the past. Wisconsin EMS Association Department Members can purchase a new Horton Ambulance and receive a $2,500.00 rebate from Horton and Foster Coach Sales, Inc.
Foster Coach Sales, Inc. is a buying partner with WEMSA for the next two years. Non members can visit their website for further membership details. www.wemsa.com Service or Corporate memberships are needed to receive the rebate. The rebate will be distributed to the department from the Association after the unit is delivered. Bio-diesel fuel is not an acceptable fuel if it is over 5% soy in most of the new diesel motors and not recommended for the older motors either. Ford will not cover damage thru the warranty if it is found to be higher that 5%. [see Ford owner's manual page 12 and Ford delivery checklist] There is a sign off sheet for the customer to sign at delivery explaining the service intervals and requirements. There is a fuel additive product available from Ford that Ford recommends to be added to the fuel we currently use for all their diesel motors. It is available from Ford dealers across the parts counter. It is called Cetane Booster and Performance Improver and each 20 ounce bottle treats 120 gallons of fuel. Click the links below for more information. This TSI contains policy and position statements for Bio diesel fuel, Bio diesel blends, recommendations for storage and use of Bio diesel blends, warranty coverage, and the impact of Bio diesel fuels on engine emissions. A 14,050 pound GVW chassis, with 159” wheelbase and Dura-Max diesel. The diesel engine is the 250 hp Dura-Max with the 4L85E transmission equipped with GM’s ambulance prep package. We now have a "Closeout Parts and Cots" e-commerce page and inventory of parts we are selling online.